For many years on my Virginia farm I had my corn crop in the ground by the end of March. But that has not been the case for the last 10 years. Spring planting season has become more and more delayed because of changes in our weather patterns. Nowadays, I find myself planting corn in May. That's why I marched in the streets of New York City last month, along with thousands of other activists and protesters supporting President Obama's message in his rousing speech at the United Nations Climate Summit. No one who calls Planet Earth home should ignore the urgent need for reforming environmental policies and practices -- worldwide. The President made history, detailing how the United States is leading the way in the fight against climate change and calling for global support. The New York Times called the President's signature action for cutting carbon pollution "the strongest action taken by an American president to tackle climate change." We need a strong plan to have the world focus on climate change actions -- immediately if not yesterday. In New York, I met many people and heard a wide range of different ideas for action on climate. But all that I spoke with agreed that climate change is a reality and action is urgently required. For the non-believers on climate change, I say, just take a look at recent erratic weather patterns. There have been severe droughts, floods, wildfires, tornadoes, and untimely snowfall. For me and other farmers, the problem is as concrete as the hard ground in early spring. The soil is just too cold to nurture our seeds. The President's Clean Power Plan proposes a reduction in carbon emissions from power plants by 30 percent over a ten year period. The measure is a huge step in the right direction. In order to continue to combat climate change, we need greater collaboration between government and the private sector. We all have to do our part. I was encouraged on this issue after attending a meeting this past summer with the Environmental Protection Agency Administrator Gina McCarthy. EPA hosted the session on June 2 toward developing a "climate action plan." I was impressed by the bold steps EPA has taken on climate change and pleased to find that we shared the same passion on the issue. 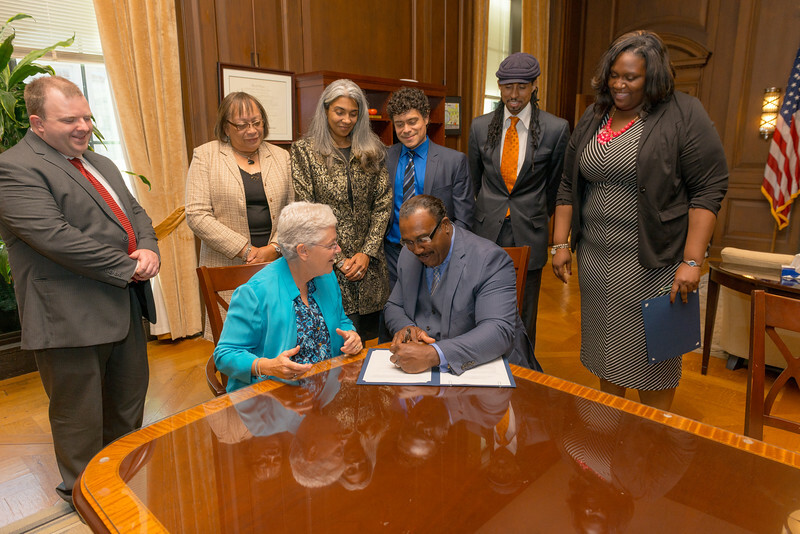 Last week, I met with Administrator McCarthy to sign a Memorandum of Understanding (MOU) which will enable the EPA to learn more about environmental issues that are most important to the National Black Farmers Association. Consequently, we will be heard on EPA issues and certainly have a voice on climate change, as farmers individually and collectively as NBFA members in our Association. If we continue to sit on the sidelines and grumble about climate change nothing is going to happen. We all have to get involved on the ground to save the only home we know.